Keep vehicles clear of lines. 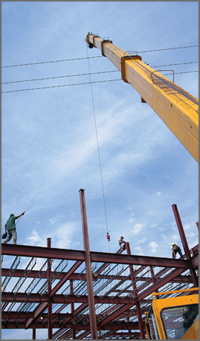 Long-bed dump trucks, concrete pumping rigs, and other high-rise equipment can contact overhead power lines. Make sure you know the required safe work distances and encroachment prevention precautions for all power lines at your job site, and respect all marked safety boundaries. Work with a dedicated spotter to comply with line clearance requirements. Take care with ladders and long handheld tools. Carry ladders, paint rollers, rain gutters, and other long objects so they are parallel to the ground. When it’s time to use them, raise and lower them carefully to avoid power lines. Adjust ladders and tools cautiously. Before adjusting extension ladders, paint rollers, or other long tools, add your own height and make sure the total height will remain a safe distance of at least 10 feet away from overhead lines of 50,000 volts or less. As voltage increases, clearance distances also increase. Consult PG&E for specific safety clearance requirements. Carry long equipment parallel to the ground, and adjust tools carefully to maintain the required safety clearance from power lines.